A fundamental question in the Atlantic Yards controversy is whether the Empire State Development Corporation (ESDC) is an enabler of projects and developers or, rather, an independent representative of the public interest. The evidence favors the former--indeed, an ESDC lawyer once said so in court. However, in a key section of the Atlantic Yards development agreement, signed by Forest City Ratner affiliates and the ESDC, a passage improbably claims that the state and the developer have been negotiating at arm's length. Such a claim seems aimed at dampening any questions about the damages facing the developer in case of default on various obligations associated with the project. The document essentially says that the damages would be significant but impossible to calculate, so "reasonable" damages have been negotiated. Are the damages reasonable? In a post tomorrow, I'll look in detail, but consider the outline: the transaction allegedly negotiated at arm's-length allows the developer 12 years to complete Phase 1 and 25 years to complete the entire project, with significant opportunities for extensions--even as the state and developer claim in legal papers that the project would take just a decade. Just tonight, Forest City Ratner Senior VP Jane Marshall, speaking at a meeting of the 78th Precinct Community Council in Park Slope, said that "the construction schedule is ten years," a careful locution that avoids promising that the project would actually get built in that time. 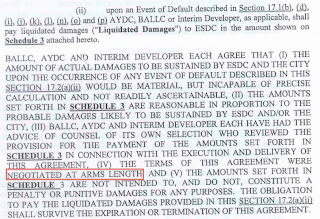 BALLC, AYDC AND INTERIM DEVELOPER EACH AGREE THAT (I) THE AMOUNT OF ACTUAL DAMAGES TO BE SUSTAINED BY ESDC AND THE CITY UPON THE OCCURRENCE OF ANY EVENT OF DEFAULT DESCRIBED IN THIS SECTION 17.2(a)(ii) WOULD BE MATERIAL, BUT INCAPABLE OF PRECISE CALCULATION AND NOT READILY ASCERTAINABLE, (II) THE AMOUNTS SET FORTH IN SCHEDULE 3 ARE REASONABLE IN PROPORTION TO THE PROBABLY DAMAGES LIKELY TO BE SUSTAINED BY ESDC AND/OR THE CITY, (III) BALLC, AYDC AND INTERIM DEVELOPER EACH HAVE HAD THE ADVICE OF COUNSEL OF ITS OWN SELECTION WHO REVIEWED THE PROVISION FOR THE PAYMENT OF THE AMOUNTS SET FORTH IN SCHEDULE 3 IN CONNECTION WITH THE EXECUTION AND DELIVERY OF THIS AGREEMENT, (IV) THE TERMS OF THIS AGREEMENT WERE NEGOTIATED AT ARMS LENGTH, AND (V) THE AMOUNTS SET FORTH IN SCHEDULE 3 ARE NOT INTENDED TO, AND DO NOT, CONSTITUTE A PENALTY OR PUNITIVE DAMAGES FOR ANY PURPOSES. adj. the description of an agreement made by two parties freely and independently of each other, and without some special relationship, such as being a relative, having another deal on the side or one party having complete control of the other. It becomes important to determine if an agreement was freely entered into to show that the price, requirements, and other conditions were fair and real. Example: if a man sells property to his son the value set may not be the true value since it may not have been an "arm's length" transaction. If Forest City Ratner pays for the ESDC’s lawyers and consultants like AKRF, how can it truly be an arm’s-length transaction? Isn't there a special relationship, or another deal on the side? Whether the transaction described herein shall be consummated or not FCRC shall reimburse the Public Parties within thirty (30) days of demand from time to time, for the following costs and expenses relating to the transaction contemplated by this MOU, including but not limited to the costs and expenses described in the letter dated February 18, 2004 from James Stuckey of FCRC to Chairman Charles A. Gargano of ESDC: (a) the cost of all environmental analysis performed by the Public Parties with respect to the Project; (b) the cost of consultants acting on behalf of the Public Parties; (c) third party legal fees and third-party fees incurred by the Public Parties pursuant to the Public Parties’ customary fee structure for outside lawyers, (d) third party fees associated with the public approval process, including, without limitation, those arising from public hearings and notices, and (e) fees and expenses associated with the condemnation process. FCRC further agrees to defend and indemnify the Public Parties from and against all liabilities (statutory or otherwise), obligations, claims, demands, penalties, causes of action, third party costs and expenses (including third party attorney’s fees and expenses pursuant to the Public Parties’ customary fee structure for outside lawyers), losses and injuries in any manner relating to or arising in connection with the Project described herein, including any enforcement of any such indemnity by the Public Parties. ESDC lawyer Douglas Kraus cited the underlying statute that establishes the state agency, "to undertake projects that promote economic development... There's nothing in the statute that says it's collaborative, but it's the way the process works." Lawyers for the ESDC and Forest City Ratner said the process was not adversarial, but collaborative, since both the developer and agency wanted the project to move forward. Jeff Baker, an attorney for DDDB, instead characterized it as "an arm's-length transaction." Now, in a different context, the ESDC is embracing the concept of an arm's-length transaction. But it sure looks a lot more collaborative. Also in February 2006, I analyzed the ESDC's record and suggested that its relationship with businesses was hardly adversarial and may not merely be collaborative, but instead positively embracing.